The interior blinds serves as ideal solution to cover any windows, whether in home or offices. These blinds reduce the glare of sunlight entering the home and also helps in protecting the furniture from direct sunlight. The blinds are the treatment given to windows with providing complete privacy with blocking the visibility. We are well known manufacturer of Vertical Blinds. 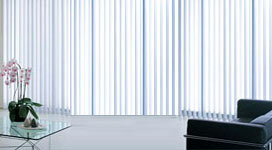 These vertical blinds are commonly used in offices, conference rooms, homes, etc. We offer a wide variety of roller blind that are fabricated using superior quality raw materials. Besides their utility also create a visual impact with dramatic architectural forms. Manufacturing a unique range of bamboo blind, we offer distinctive styles giving a casual and refined appearance to the room décor. The printed and non printed bamboo blinds offered by us are capable of meeting all the aesthetic needs of our customers. Triple shade blinds are our innovative products that combine drape, window screening and curtain blinds. These blinds are made from a triple..